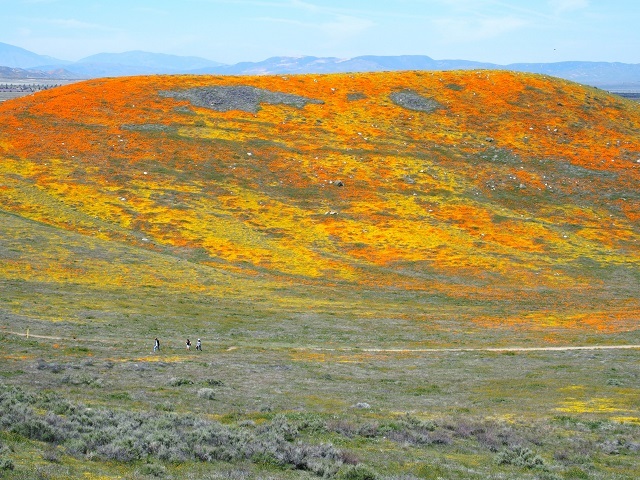 If you're in SoCal like we are, take a break from games this week, go outside, and see this year's super bloom. This guide will show you how. Spring in Southern California can be fickle. Some years our springs are grand, while other years, spring barely warrants a footnote in the rain charts. This year's spring brought the rains Nature demands to fully liberate her color pallet and reveal her artist's power. Her brush strokes are only this grand every few years, so put down that game, grab your sweetheart, and head for the hills. 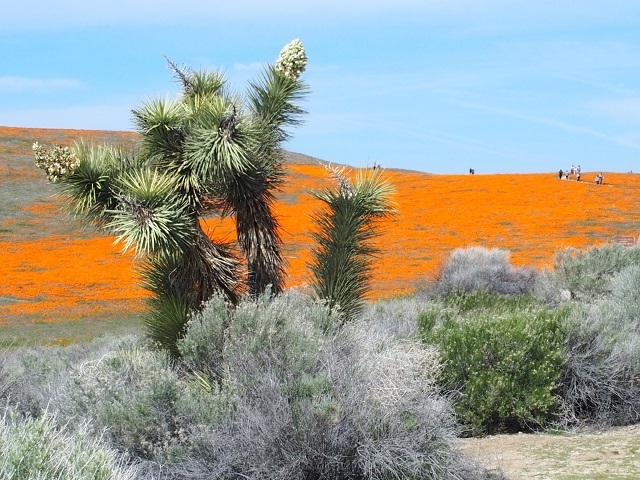 The Antelope Valley California Poppy Reserve is nestled in the desert grasslands of the Antelope Buttes, 15 miles west of Lancaster. It boasts over 7 miles of trails winding through 1800 acres of Nature's beauty. 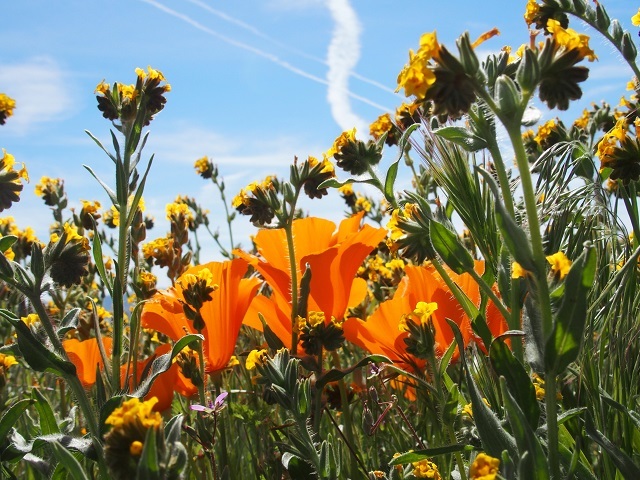 Established in 1976, it was founded to protect an area with reliably outstanding displays of native wildflowers, in particular, our state flower, the California Poppy, Eschscholzia californica. The 2,000 square foot Jane S. Pinheiro Interpretive Center provides educational displays and poppy-related art and items for sale. Also offered are two Junior Ranger programs. One is a Visitor Center Scavenger Hunt where the child earns a Junior Ranger Sticker upon completion. The second program requires the child to fill in the answers on a Junior Ranger Adventure Guide, where upon completion, the child takes an oath, is sworn in as a Junior Ranger, and is awarded a very nice metal badge. The child is then logged into a book and receives a Junior Ranger logbook of their own that they can collect stamps from every park they visit. After visiting so many other parks, they start to collect additional awards. The California Poppy, our Cup of Gold, is definitely the star of the show. Blankets of orange sweep across the grassland, their delicate petals fluttering in the wind, like millions of butterflies resting in the sun. Look a bit closer and you'll see an assortment of flowers representing the rainbow's spectrum of color: from Red Maids and Red Stem Filarees to the butter-yellows of Goldfields, Acton Daisies, and Cream Cups. From the maroon Owl's Clover to the pale-yellow Desert Parsley. Even the blues and lavenders appear in the Pygmy-Leaved Lupine, Lacy Phacelia, and Blue Dicks. Not to be outdone, the two Joshua Trees by the Interpretive Center are still boasting creamy-white blooms. All the flowers in the park are nature-made, with no human intervention. No seeding, no reseeding, no supplemental water, no manipulation what-so-ever, so the glory that we see is what Nature intended, and this year is an especially spectacular bloom. In any healthy ecosystem, there is a balance between the flora and fauna, and here is no exception, However, due to the crowds, the chance of spotting any of the local wildlife is slim. Once the crowds dissipate, the Park hosts quite a variety of critters: rabbits, squirrels, kit foxes, badgers, coyotes, bobcats, and more. If you look up from the flowers, you may spot a Red-tailed Hawk, Burrowing Owl, or any number of song birds, and even a Quail or Roadrunner. There are also a variety of beetles, insects, and butterflies in amongst the flowers, and a selection of lizards that eat the insects. One notable beetle is the tiny black spec that you may see on your light-colored clothing after visiting the poppies on a still day. These are the main pollinators in the Park, and are completely harmless to people. Just give your cloths a gentle shake before getting back in your car, and leave them behind to pollinate the next generation of flowers. There's life underground too: mice, gophers and kangaroo rats to name just a few, plus the rattlesnakes and gopher snakes that feed on the rodents. Without the snakes, the rodent population would get out of control and would decimate the flowers and vegetation. The Park is in close proximity to the Angeles National Forest and works with neighboring agencies to be a linkage in the larger wildlife corridor that allows larger animals free movement across the land. If you are hoping to spot one of the larger mammals, find a bench on the fringe of the park in the early morning or at sunset and sit very quietly. Your efforts may be rewarded. Go here for the complete list, but here are the highlights. As you walk the trails, you will see patches of bare dirt reaching back into the flowers. These are spots where people stepped into the flowers last year, and today, not even our wild grasses are growing. Poppies simply do not grow in compacted soil and will die if their roots are disturbed. A Poppy Pedestrian Walkway has been installed from the street to give easy access into the Park and to prevent visitors from trampling the delicate flowers and grasses. Once the dirt has been compacted, flowers and native grasses will no longer grow in that patch of soil for years to come. There is no fee for walk-ins, so don't jump a fence to 'save a buck'. Not only are you likely trespassing on private land, you're Dooming the Bloom (uncool) and trampling through snake territory. Snakes?! Yes, this is rattlesnake territory, and they don't like to be disturbed or threatened. Snake bites can and do happen and encounters are relatively common. 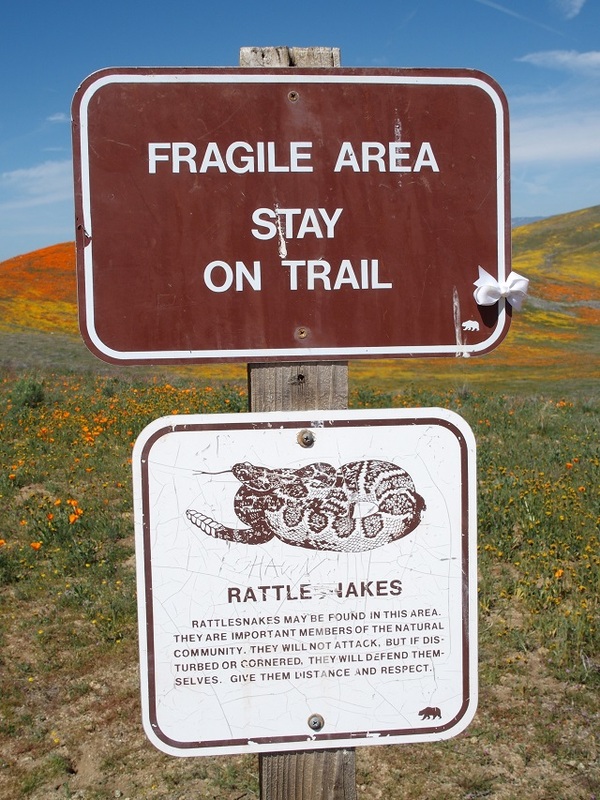 Rattlesnakes are in close proximity, and the rangers do have to relocate them frequently. Yours truly nearly stepped on one that was crossing a trail a few years back. (We jumped back and respectfully gave the snake the right-of-way.) Rattlesnakes will not aggressively attack, but they will defend themselves. Still tempted to stop at that gorgeous patch of poppies by the roadside, away from the State Park and the peace officers? Funny thing is, the snakes don't care if you're on private land or park land, they bite just the same when they feel threatened. So, don't think you are being clever by sending the kids or your beautiful sweetheart off into a random patch of roadside poppies. As tempting as it may be, people have been bitten by snakes in the poppies. 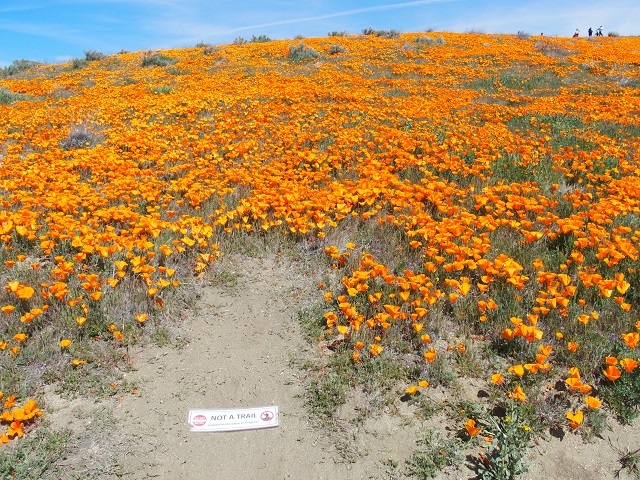 Don't Doom the Bloom: stick to the trails, stay alert, and enjoy the poppies for years to come. Thank you. The Park is open through Mother's Day Weekend, but don't procrastinate. 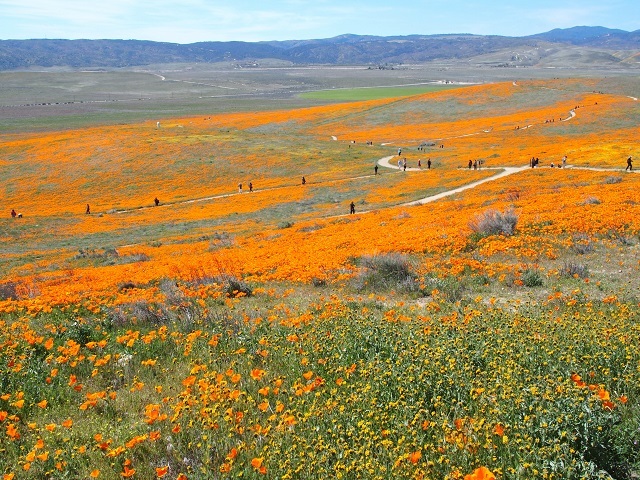 The peak bloom in the Poppy Reserve this year is late March into the early days of April. However, if you miss the peak-rush, California Poppies have second and third blooms that are expected to last at least through Mother's Day. While smaller than the first flush, they are still very beautiful. The Reserve is located 15 miles west of Lancaster at 15101 Lancaster Road; Lancaster, CA 93536. If your GPS drops you off at this side-road, then you've stopped too soon.
' I5 North to CA-14 North, exit West on Avenue I: This route is the simplest and likely the quickest, especially if the freeway traffic is moving.
' I5 North, via San Francisquito Canyon Road: This route makes for a beautiful Sunday drive through our Southern California mountain passes and canyons, but is not the simplest due to meandering roads, no passing lanes, and 'Sunday Drivers' enjoying the views. Poppies open and close based on the temperature and wind. The magic temperature is about 63 degrees. Below 63 degrees, or with strong winds, the poppies close up. 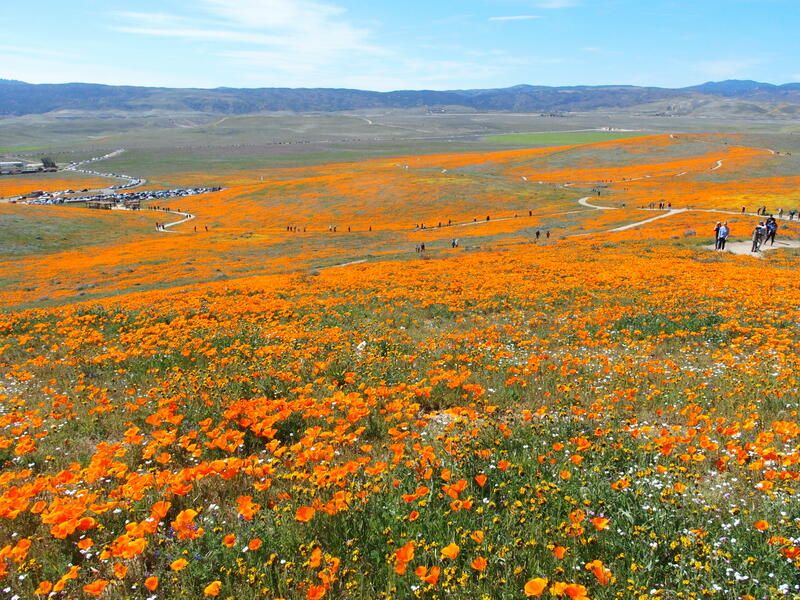 Above 63 degrees, without strong winds, and the poppies open up to their full glory. Never fear, even if the winds are strong on the day you visit, you will still see fields of orange. If you are hoping to capture that perfect photograph of a poppy opening into full bloom, then early morning is your best bet. Light plays with different colors throughout the day. Eastern shots may be more spectacular in the morning, while western shots, with the sun setting, may be gorgeous in the late afternoon. Early morning. On a typical weekday, the line of cars starts by 9 AM. Once that line reaches back to the street, the wait can be an hour just to get up to the kiosk. Once the parking lot is full, the Park only lets one car in for each car that exits. On weekends, the lot can fill up by 8:30 AM to 9 AM. Parking outside the park and walking in is allowed, and walk-ins do not pay an entrance fee. There are some no-parking zones for safety reasons, so pay attention to the signs and park responsibly. The Park newly installed a pedestrian walkway from the street up into the Park's entrance for improved safety and to keep people off the flowers and grasses. Do not jump the fence or take a short cut to the entrance! The Park has also hired peace officers who do issue citations to people who Doom the Blooms (walk on the flowers). If you do walk in, please patronize the Interpretive Center and leave a donation for the Park's maintenance. The Park has a semi accessible paved trail that goes about a quarter of a mile to a sitting area. Otherwise, the majority of the trails are packed dirt that can accommodate most casual hikers and people with strollers. If your footing is uncertain, you may appreciate a walking stick or two for the steeper trail sections. The ADA parking spots fill up quickly, so a drop-off zone is also available. The Park is working to expand ADA access in the near future. Bring your good hiking or walking shoes, your camera, water, food, sunscreen or protective clothing (dress in layers), and a hat that will stay on in very high winds. If you're an artist, you'll definitely want to bring your sketch pad and colored pencils. 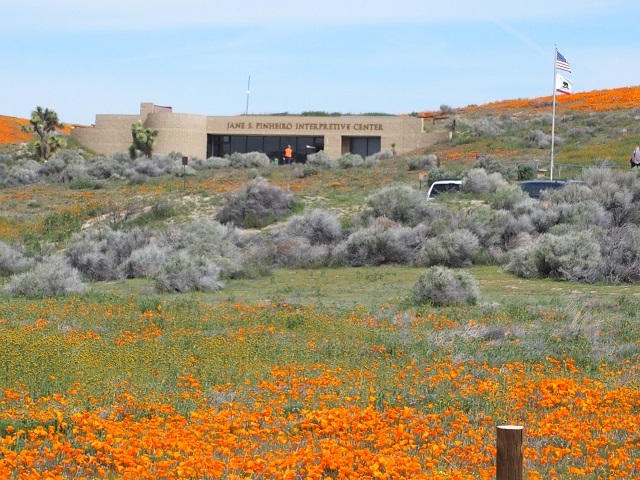 While you are in the Interpretive Center, consider joining the Poppy Reserve Mojave Desert Interpretive Association. It's a California State Parks Non-Profit Cooperating Association that supports educational projects and programs for schoolchildren and the visiting public at five CA State Parks. The Interpretive Center's shop sells poppy seeds. Why not give it a try at home? 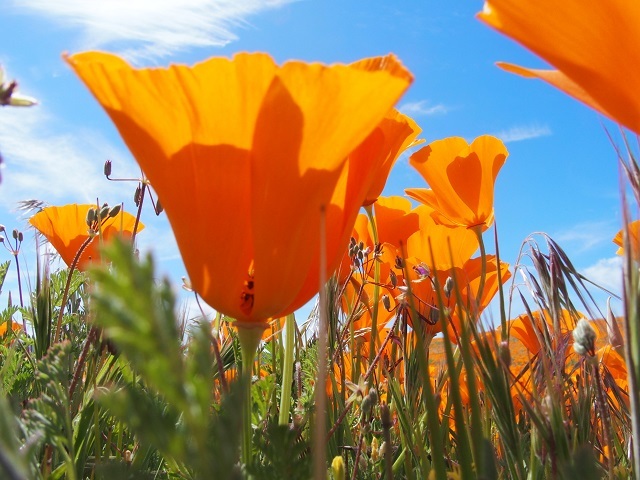 In this era of water conservation, California Poppies may be the perfect plant for that dry patch of land, and since poppies don't survive if their roots (tubers) are disturbed, seeds are the only way to go. 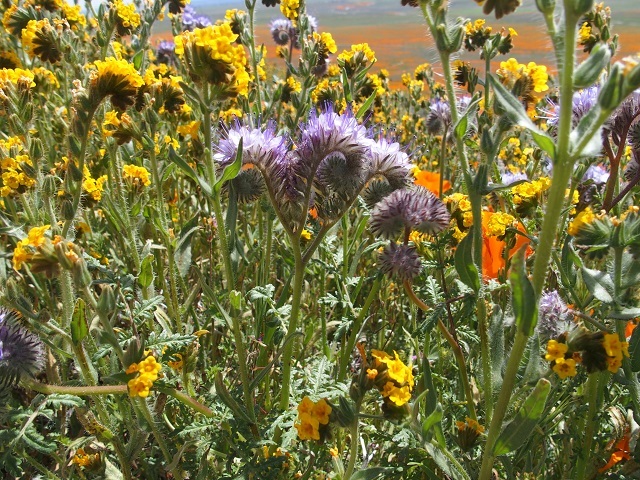 The Theodore Payne Foundation offers a helpful guide to Sowing California Native Wild Flowers. A tip from the Park's Russ Dingman, is to start the poppy seeds in the freezer to crack the outer seed coat. Just place the seeds in water in the freezer long enough for the water to set, then place the ice cube seed packs out in the spring. An ice cube tray works well for this purpose. Special thanks to Russ Dingman, District Superintendent for the Great Basin District, and Chris Hon, Senior Environmental Scientist, for patiently answering all my questions. Now a special treat for all our readers who love finding Easter Eggs in games as well as IRL: Remember that side-street the GPS stopped short at? 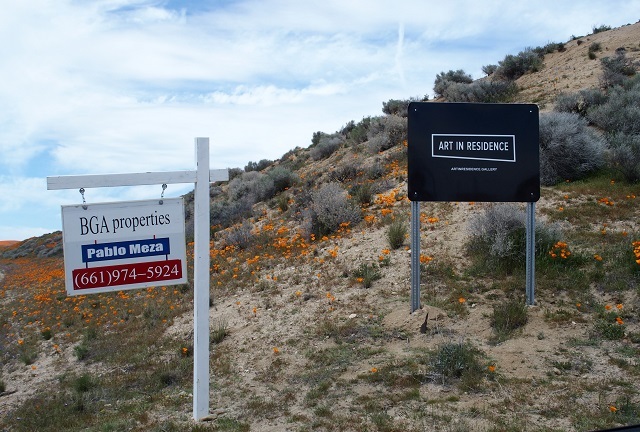 Are you curious about the 'Art in Residence' sign? We were, so we turned off the main road, drove up the short rise, passed the piles of rubbish, and left the paved road behind. What adventure would we find? What we found was a wonderfully unexpected surprise. The Antelope Valley has an active and vibrant art community, and we had stumbled upon an art exhibit by Nathaniel Ancheta and David Martin. 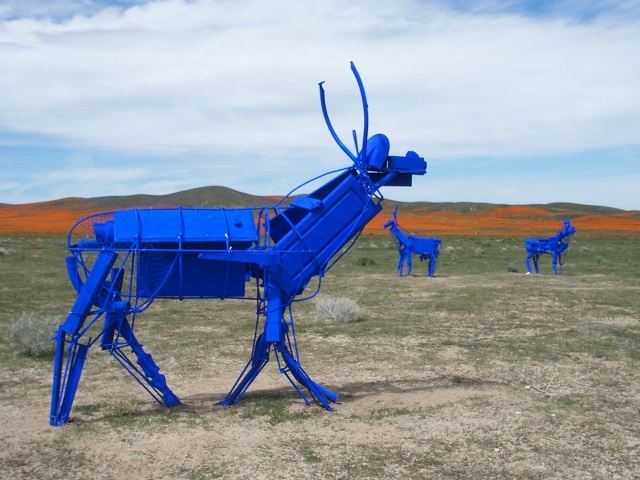 The vibrant blue of the artists' antelopes contrasted spectacularly with the golden-orange poppies in the background, the green blanket below and the blue and white sky above. Nature provided the perfect setting for this Art in Residence. If you are interested in learning more, visit Antelope Valley Art. We continued down the dirt road, hoping to see more exhibits, but all we saw were many people jumping fences (trespassing), dooming blooms, and playing dice with rattlesnakes. Please don't be those people. The loop we drove took us to a side-road that definitely required a serious four-wheeled drive vehicle, so we turned around and exited the same way we entered. The dirt road is easily passable to the exhibit by a regular sedan, however, take caution if it rains and the road turns to mud.